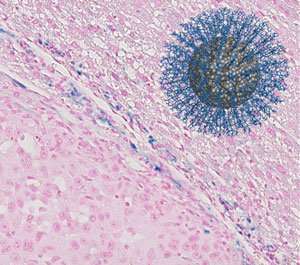 Peptide-coated magnetically active nanoparticles developed for contrast-enhanced MRI detect a liver tumor. Credit: American Chemical Society. Cancer will become easier to detect and diagnose early using magnetic resonance imaging (MRI) thanks to A*STAR researchers who have engineered biocompatible iron oxide nanoparticle contrast agents¹. While gadolinium-based compounds have proven effective as contrast agents for enhancing the signal-to-noise ratio during MRI, they can cause side effects such as the nephrogenic systemic fibrosis that can affect patients with reduced kidney function. Iron oxide nanoparticles have emerged as low-risk alternatives. In complex biological environments, however, these nanoparticles tend to degrade, aggregate, and adhere to other substances, which reduces their magnetic activity. To mitigate this issue, a team led by David Paramelle, from the A*STAR Institute of Materials Research and Engineering, has developed peptide coatings that prevent nanoparticle decomposition and aggregation while facilitating biocompatibility. These coatings are crucial for the transition of iron oxide-based contrast agents to clinical use. Building on their extensive experience of peptide-coated silver and gold nanoparticles, the researchers created a library of short peptides and deposited these compounds on the iron oxide nanoparticles to produce various single-layer films. They also synthesized analogous ligands to fill any gap between peptides on the nanoparticle surface and generate mixed coatings. Each peptide comprised a stem connected to a 'foot' and a 'head' at each extremity. While the foot anchored the peptide to the nanoparticles, the alcohol-functionalized head stabilized the nanoparticles and stopped unwanted interactions with the environment. "The tricky part was to find a foot with high binding strength," Paramelle explained, because, the iron oxide nanoparticles presented a different chemistry despite their similar spherical geometry and size to gold and silver nanoparticles." "To design the peptides, we had to go back to the drawing board," says Paramelle, noting that switching from noble metals, which preferentially bind to sulfur-containing molecules, to iron oxide broadened the range of functional groups serving as a foot to include phosphates and carboxylic acids. Through increasingly rigorous tests, the researchers assessed the ability of each film to stabilize the nanoparticles under biological conditions while maintaining their magnetic properties. They discovered that peptides and ligands bearing two phosphate groups at the foot performed best in the presence of liver cancer cells. The peptide-coated nanoparticles outperformed commercially available contrast agents without destroying cells in vitro, and strongly enhanced the contrast between tumorous and healthy tissue during in vivo MRI when injected into mice with liver cancer. Paramelle's team is investigating ways to widen the application of their system to other cancers, especially breast cancer. "We plan to functionalize the nanoparticles with antibodies and control the number of these antibodies on the nanoparticle surface," he says.